I found this in a collection of things from my great grandma's attic. She was born in 1912, and my Grandma came along in 1938. I'm not sure who's bear this was, but he was well loved. I notice his eyes are missing, but there are shanks where they should be. 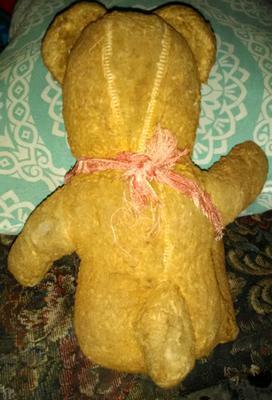 His nose is stitched, as are the claws on his paws, and his seam is along the back. He has multiple spots where he was sewn back together, but the thread is still taut and it blends well. There are no movable parts to this bear. I was surprised by how much the bear weighed when I picked it up. The stuffing is confusing. It feels firm but is still squeezable. Not like the plush teddies today. The fur is also confusing. I don't know if it was once soft mohair, or if it's wool or synthetic. It feels kind of scratchy, but he had not been stored properly and maybe that has something to do with it? 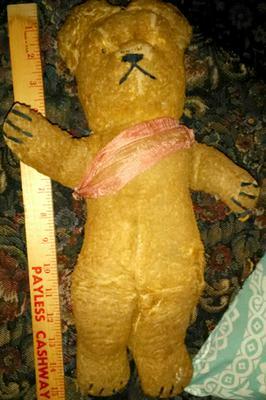 He's about 15.5"-16" tall with a little stubby tail. 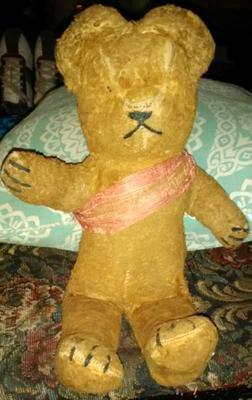 I'd love to know more about my bear. If you know details related to the age and maker or any extra interesting facts, please share! I also found a photo of my grandma as a toddler holding the bear! !